By 1801, the population of the whole of Shoreditch (of which Hoxton was a part) had grown to 34,766, doubled to 68,564 by 1831 and in 1861 was 129,364. 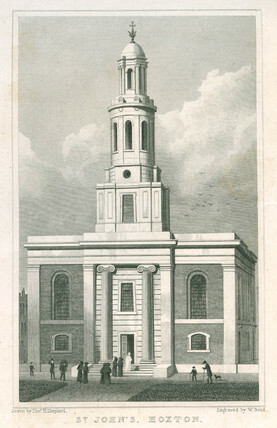 As the population grew the parish of Shoreditch was divided and the present parish church of Hoxton, dedicated to St John the Baptist, was erected in 1825-6. The neo-classical Church was designed by Francis Edwards and built by the Commissioners under the 1818 Act. I was employed to carry out the paint analysis of the railings around the church. The railings appear to have been painted on nineteen occasions. The first scheme applied was in a warm stone colour. A variety of colours have been employed since, ranging from mid grey, stone colour, red-brown, green, and black. These colours reflect the conventional treatment of external ironwork of the period and similar colours have been found all over London (as can be seen in the paper below). Gilding was employed on certain elements as part of the sixth scheme.